Somewhere on the same website above is information on linking the TCS keep alive to the Looksound decoder. Glad that it seems to have cleared up the motor issue. Seems like there is no perfect decoder. Let's see what we can come up with in regards to getting better sound out of the Looksound. So far, I'm having good luck without the keep alive for the Shay. Seems like the wow and tsunami need them badly. We will see over time! I agree, the Loksound is seems to not be so sensitive, and actually I could live with it the way it is and just keep the track cleaner than I have been. Back when I had an HO layout and all Soundtraxx decoders I was fanatical about keeping clean track and wheels. Once the keep alive stuff came out I got sloppy with track cleaning. I am rooting for the SCR to get a new and larger home. When you transition to this new home, I urge you to look into dead rail. The purist modeler in you would probably jump at the chance to eliminate frog gaps and insulated joiners, not to mention uninterrupted sound/power. Jeff, I just got the new Model railroad Planning mag. Great article. 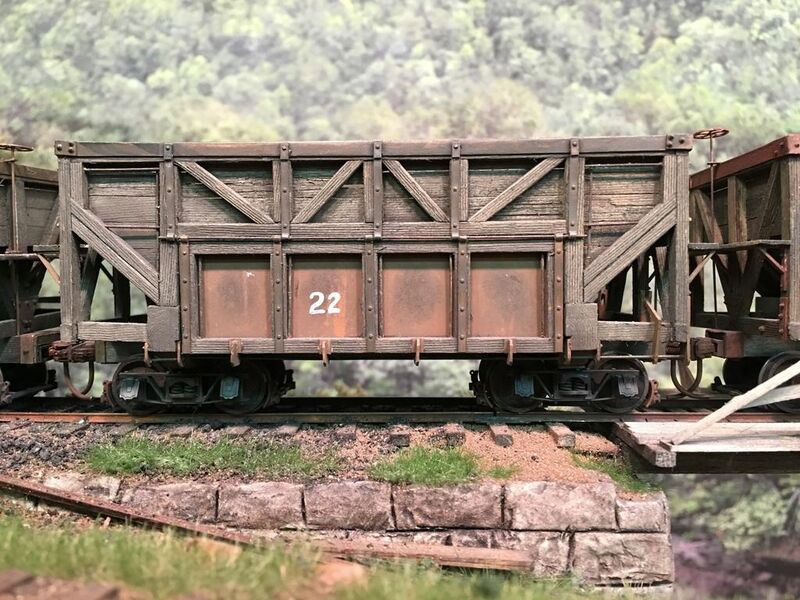 while I am pondering the decision to build the addition to our house I decided it was time to upgrade the first five hoppers I built to match the final hopper car design. The upgrade consists of changing the trucks from SJCC 202 trucks to 220 trucks (they are bigger with a longer wheel base), change out the door latch details with the parts I had laser cut, and rebuild the center frame section so the door mechanism matches and operates like the rest of the fleet. I also am taking this time to adjust some of the coloring and fix some paint issues. So far I have three of the five completed. Jeff, really nice hopper cars. 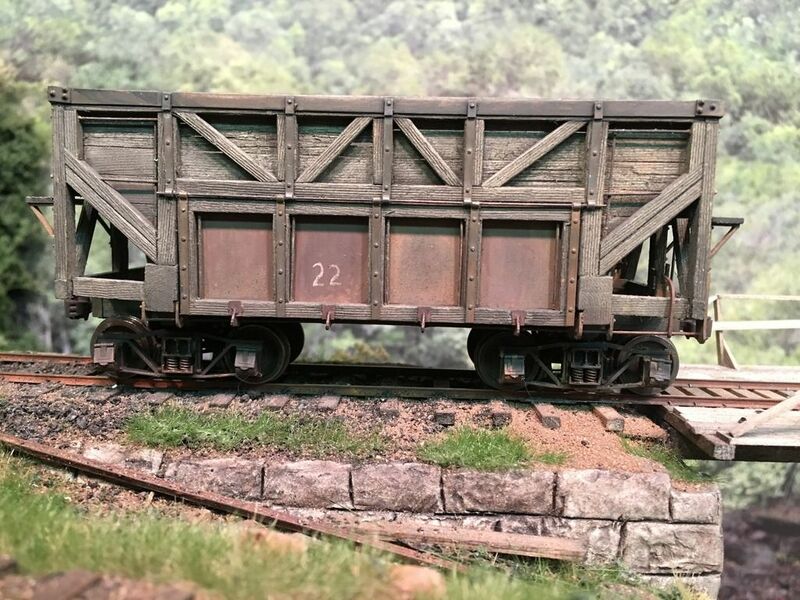 The O scale items really lend themselves to all the extra detail you've added. I am still picking away at the hopper rebuilds, only 1 1/2" more to go and they will be all up to date. While I was working on these hopper cars I had an idea to solve a problem I have been having. Since I have switched over to Sergent couplers I had troubles getting the hopper cars to couple. the trouble is not the operation of the knuckle, it is getting them lined up to couple. The Sergent couplers operate very well, they are awesome for uncoupling and they do couple very well but because not all of my sidings are up close and in the perfect view of the operator it has been a pain to get the couplers to be lined up for coupling. Also, if the car is under on of the tipples or inside the unloading shed and I need to couple I have to reach in and move the coupler to center. The reason for this is that I typically offset the couplers in the hard to reach areas and then shove in to spot the cars. With a Kadee coupler as soon as the cars separate the couplers are sprung back to center and ready to couple, the Sergents do not have a centering spring and the couplers are left offset which means I have to reach deep into the scene or structure to align the knuckle. Also, if a car is sitting with its knuckle closed you have to use the uncoupling tool to open the knuckle, and that procedure normally moves the coupler off center. As a test I came up with a way to use the old Kadee On3 coupler centering springs to center the Sergent couplers. I make a cut in the side of the coupler box and slip a spring in the cut on each side of the coupler. The cut holds the coupler in the box and keeps it from flying out. If I decide that having centering springs is what I really want then I will try to come up with a better method, maybe some whiskers on the couplers like some of the Kadee couplers have, but for this test I just am using what I have on hand. Also, since Minnesota is having a record warm winter and what seems like an early spring I took advantage of a warm day and broke out my abrasive air gun to blast my brass shay so I could get it painted. So far I have just got a basecoat off black on, the smoke box and firebox, and some of the weathering started. The decals I printed on my Alps printer. I was going to number this locomotive #7 but since it is such an almost part for part copy of Manns Creek #2 I numbered it as SCRy #2. I almost decaled if for Babcock Coal and Coke so it would be a prototype model that I could have entered in a contest but in the end I wanted to maintain a family look for my locomotives. here is the boiler and frame. I started to weather both of these. The bright rust is just the base layer and will be covered and toned down as weather progresses. I also am going to remove the Soundtraxx decoder and replace it with a Loksound decoder with a keep alive. I forgot to mention a few things. First, regarding the couplers, the springs are just a test to see if I want them centering, if self centering causes issues then I am going to switch back to Kadee couplers. However, if self centering couplers make these operate better I want to come up with a way that will have them center and not require that big Kadee box, which is so obvious from the photo above. Trying to fit that huge Kadee box in some models has been a real pain. regarding the Shay, the extra effort I went through to lag the boiler and to use real wood for the floors really paid off I feel. As you can see in the photo above the wood has an obvious different texture then the brass (metal) parts. Also, as I start weathering the dents in the lagging and the separation around parts (like the steam delivery pipe) are really showing well in photos. Your shay does have a nice look to it. Seeing the trouble you are going through with the Sargent couplers and after reading your article in MRP, I will be mocking up the one large structure I plan to place between the aisle and track on my layout to see how it affects operation. 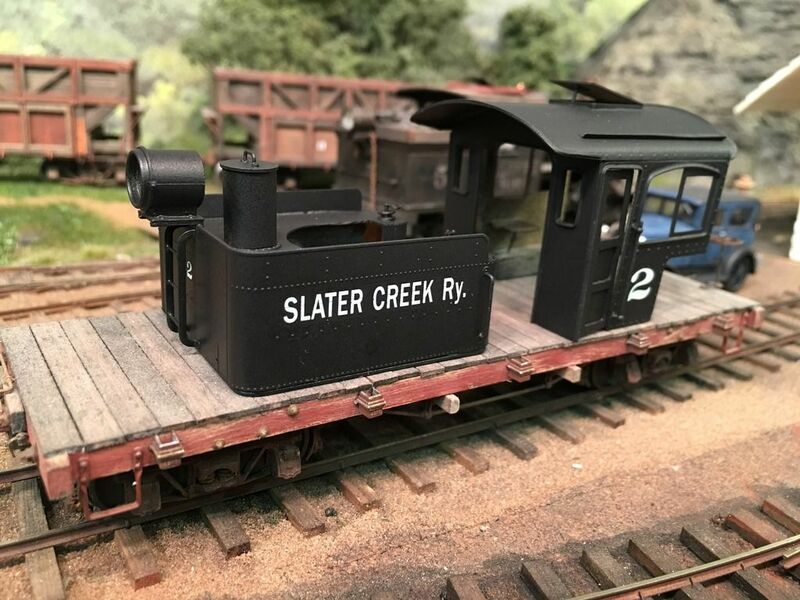 If you build the addition to your house and are able to modify the Slater Creek, will you eliminate having large buildings between the aisle and track work? Loco is looking great. Interested in how the coupler effort works out. 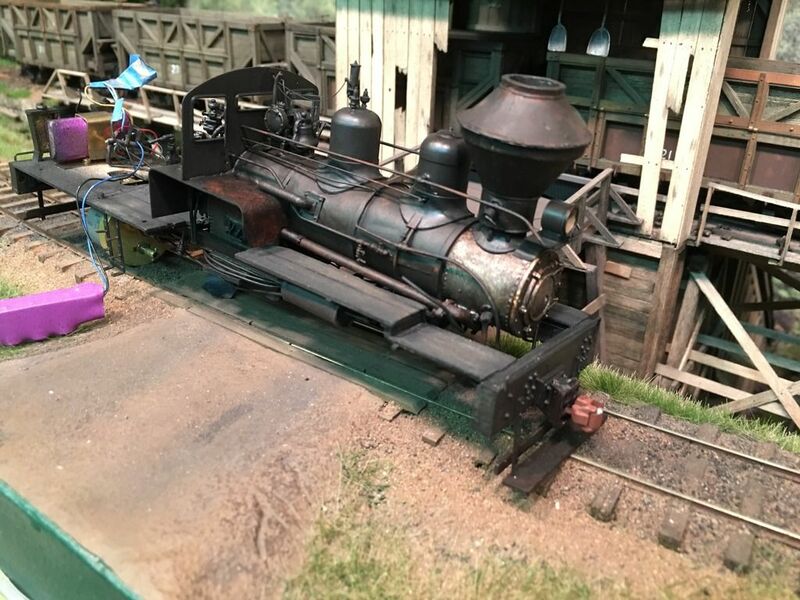 I recall an O scale builder that put a spring wire tail on a coupler to keep it centered but I believe it was a long car with room behind the coupler. no, I will not be placing any large structures between the operator and tracks unless it is a location that uncoupling is normally not done. Right now I am leaning toward not building the addition because there is a gas fireplace on the wall in what will be an adjacent room and the chimney is causing a big issue. I stopped at a place last weekend to see what the cost is to upgrade and move the fireplace, and it may not make it worth it. I don't want to ruin the other room just so I can have a bigger layout space, and then make the house hard to sell some day. so, if I end up keeping what I have I will eliminate that large company store and figure something else out. I find that with the Sergent couplers it is better to be more up close to the trains, which I find better no matter what couplers I am using. I will be following your sergent coupler experiment closely. I plan to convert my fleet soon as well. 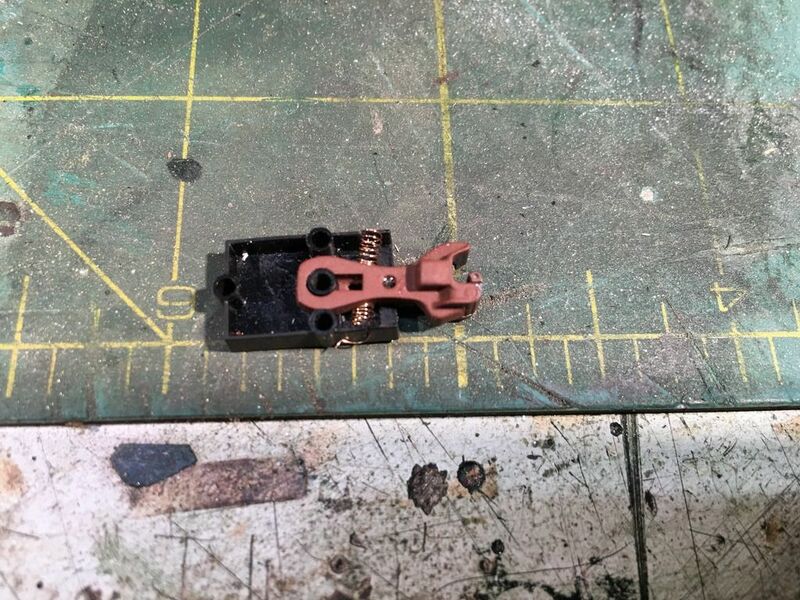 Here's another thought: what about cutting up copper strips the width of the height of the coupler box and folding into a simple spring? May be better than dealing with the prospect of the coiled springs jumping out of place or otherwise becoming distorted.